There is a lot of talk in the media about needing to reduce our production and consumption of plastic. Plastics are causing global pollution issues and we need to address the issue now. 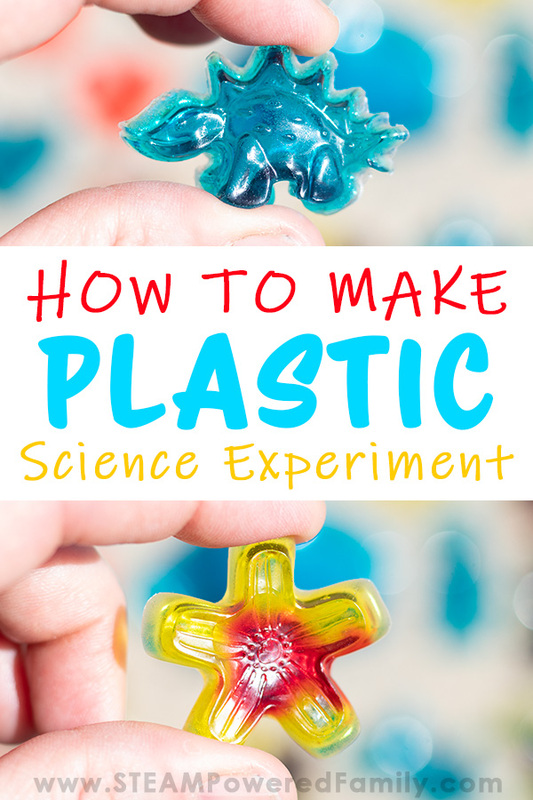 When a topic like plastics is at the top of the news, I like to do some science experiments and activities with the kids to get hands on and explore the issue. In this case we have already successfully made milk plastic many times. 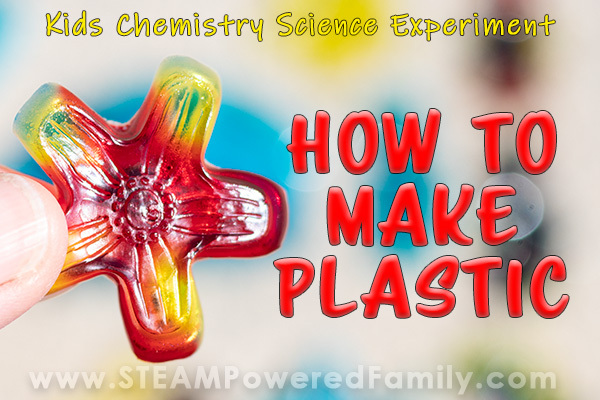 It’s a favourite activity around here, but one thing we wondered, could we make a clear plastic? 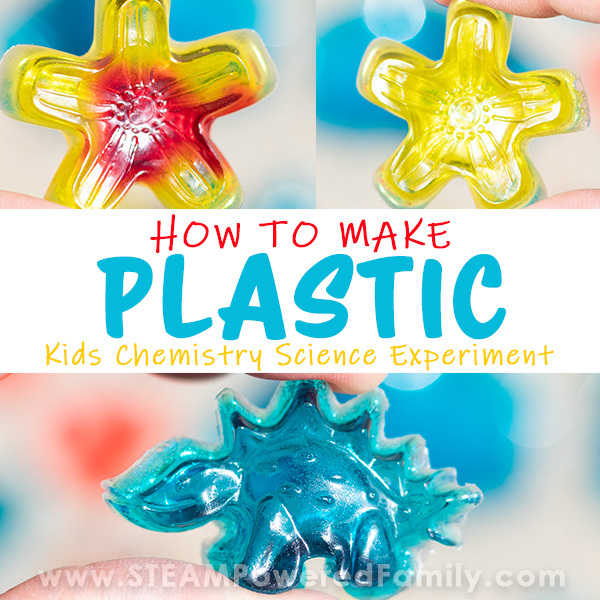 Turns out we can make plastic that is clear, using another kitchen staple, gelatin! Plastics are a really hot topic of conversation in our neck of the woods. We had an amazing recycling program, but our government recently announced it is stopping the recycling of all plastics. It turns out the demand for recycled plastics is not there and it is cost prohibitive. At least that is what we are being told. After years of living a routine of reducing and recycling, losing that recycling step is causing us to really stop and take a look at how we use plastics in our lives. It also raised some questions about why plastics are so bad and what could be done differently. We discovered there is a push towards bioplastics and it turns out we already did some scientific investigations into bioplastics with our milk plastic casein experiments. But this time we wanted to try something different. We wanted something that looked a bit more like plastic… clear and shiny. The answer was waiting in our pantry. 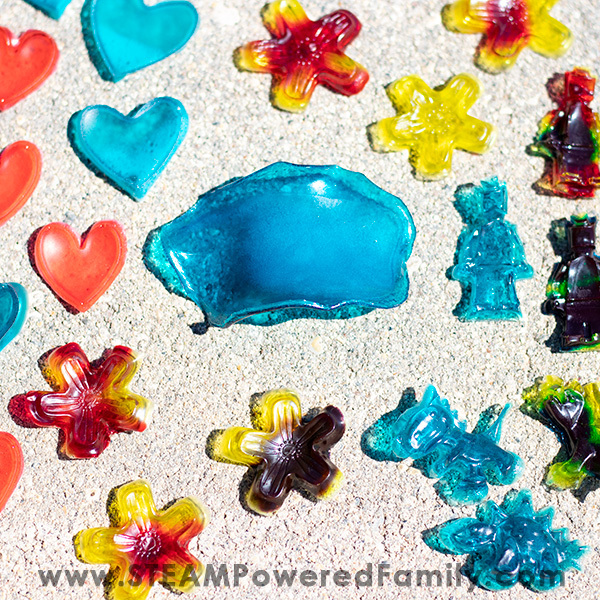 We’ve used gelatin in the past to explore edible polymers in the form of homemade gummies, which are always a huge hit. Just make sure not to let little ones try to eat these! Check out this video of me playing with some of our bioplastic creations! Add 75mL of water and 3 gelatin packets to the pot. If desired add 2 or 3 drops of food colouring. Whisk together over medium low heat until completely mixed. Once the mixture starts to steam and thicken a bit, remove it from the heat. Using your spoon gently scrape the foamy layer off and discard. If you don’t remove all the foam now it will cause some cloudiness in your final plastic. This isn’t all bad and we left it on some batches and removed it on others. The better you are at removing the foam, the more clear your final plastic will be. There are two different options for what you can do next. 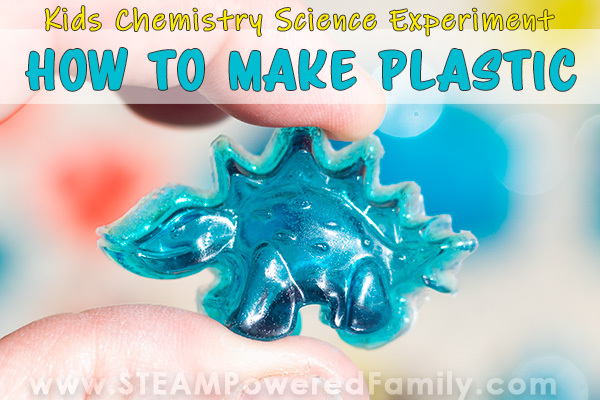 You can pour your solution onto a container lid and leave it for about 45 minutes. After 45 minutes you will have a rubbery consistency material. You can cut it with cookie cutters, scissors, or a knife. You can shape it by hand. It’s neat to play with and I recommend doing this with at least one batch. We left ours on the lid because we wanted to see what would happen. Turns out as it cures into a hard plastic it twists and lifts creating neat shapes. It took about 2 days to cure completely and give us hard plastic. The second option is to use silicone molds. Carefully spoon your liquid solution from the pot into your silicone molds. I found it was better to fill the molds and make them quite thick. If we only added a bit to make thinner pieces, they tended to twist and curl in the molds as they set. The issue with making them thick is that it takes much longer to harden and set. Our thickest pieces spent 4 to 5 days in the molds curing, then another 2 days hardening before they were completely cured. 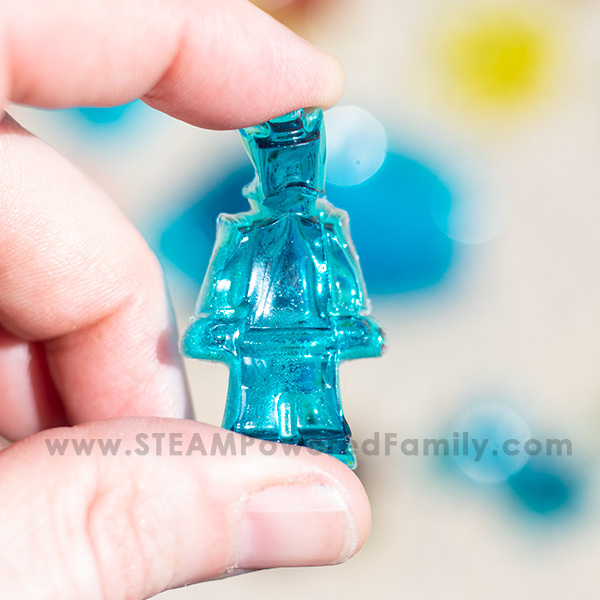 But you can get the coolest little plastic shapes! While making some of our pieces in the molds I poured in our gelatin solution, let it set for about 5 minutes, then added a drop of a different colouring. This created some really pretty designs. If you do it while the solution is still really hot and liquid, it will mix more, the cooler the solution, the less it will mix in. This plastic does tend to curl. Play with your consistency, humidity, and molds to see what reduces the curling for you. We found thicker pieces left in the molds curled the least. We also tried placing a book over our pieces to prevent curling. This also worked but did flatten our pieces a bit. Notice our homemade Lego minifigs look like they are nodding and bowing! The thinner part of the neck caused some issues, plus I didn’t fill these molds all the way. I have some ideas we are going to test in future experiments to see if we can address the curling issue. Cloudy plastic means you need to remove more of the foam from the top of your solution. You can also try not being as aggressive in your whisking of the mixture. Not curing. Give it more time! This is not a fast experiment. It takes days, but we never once had any not cure nice and hard. This project, along with our milk plastic experiment, create what is known as bioplastics and are created from biomass or organic matter. Bioplastics are different from most mass produced plastics that are created from fossil fuels. Gelatin is created by breaking down collagen which is found in all animals where its function is to bind cells together. Collagen is a very long chain of amino acids, the building blocks of proteins, that bonds to itself in a triple helix pattern. Gelatin is long chains of hundreds of amino acids. At room temperature it is solid, but when you heat it up the bonds between the chains loosen, allowing them to slide and stretch apart. Gelatin also has a strong affinity for water. Hydrogen atoms that are attached to the side of the chains can bond with water molecules. When we heat up and mix our solution we are weakening the chains, then during the cooling process those hydrogen atoms form connections with the water molecules. This is called a hydrogen bond. In our solution we have added a LOT of gelatin to a fairly small amount of water. All those water molecules bond with the hydrogen molecules, then the amino acid chain also starts to bond with itself, trapping those water molecules within it’s complex 3D structure. 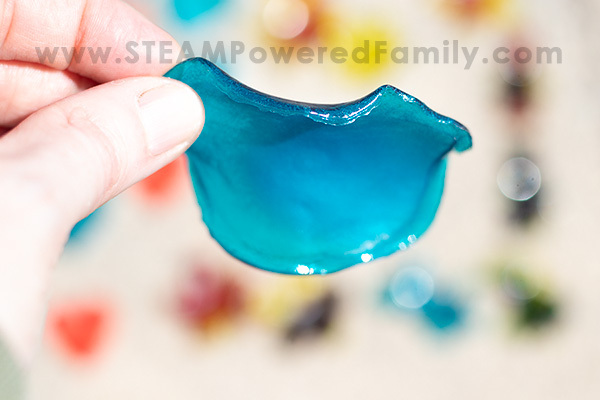 If we used more water, we would end up with more of a gummy candy consistency or even a jello consistency. But in this experiment all the water molecules are used up, so once it finishes curing we end up with a very hard plastic. Fascinating, isn’t it? For even more information on chemistry of gelatin, check out this article. And don’t forget we have a great resource on Chemistry for Kids. In the coming weeks we are going to take our study of plastics even further. We are going to make Milk Plastic, using these same molds. Then we are going to conduct some tests to see what breaks down the plastics. Since that is the biggest concern with fossil-fuel plastics today in our environment, that they don’t breakdown or take many, many years to breakdown, we are curious how our bioplastics will hold up. I also have been doing some research and want to test out some other ideas to help with the curling and twisting issue of this plastic as it cures. Join my mailing list to be the first to hear about how these future studies turn out. Thank you! This sounds like a great activity to try with my Girl Scout Brownie troop! I would love to know exactly how to make the flowers that are pictured! I hope you can share more! The shape is based on the molds used. We had great fun making these. We did.add.paint as we had no food colouring. After a few days some of them started to go watery and then mouldy. Especially the batch we added extr gelatin too. Any ideas why? Best thing to do is experiment to see why. To me it sounds like maybe you didn’t let it heat quite enough for the polymer strands to fully form. Or it’s possible your paint caused the issue. Experiment and see if you can figure it out. I’d love to know the answer so I can help anyone else that runs into the same issue. Mine are still in perfect condition after 6 months. We tried your milk plastic experiment but unfortunately even after following the directions perfectly we only ended up with crumbly curds that we couldn’t mold or manipulate without them falling apart. We even did the extra hour vinegar soak as implied. Any suggestions? The curds are crumbly yet still have some moisture in them. You need to ensure you pack them into the molds nice and tight. You can’t sculpt them like clay. The drying and curing process in the molds is what allows it to harden into plastics.